Typically, the term “crossing the floor” is used in politics. It is where a member of a political party leaves their current one and goes over to another. It all started almost a year ago, shortly after the Siege of Orgrimmar started. I had stopped playing consistantly, and was playing more Diablo than Warcraft. There were times where I went over a month between logins. On my Horde Main, I did the LFR stuff to get achievements (not actually getting my Garrosh kill until a month or two before 6.0 dropped), yet it felt that I was doing it for the sake of completion and nothing else. At the same time, I was working more on my Alliance Mage that I had transferred to play with some friends that I had met in real life a while back. This was mainly due to the fact that I wanted to see the Alliance version of Mists of Pandaria, and to play with some other friends. Shortly before Warlords was launched, I found out that my guild had decided to merge to get prepared for Mythic raiding. I was definitely surprised at this, but since I wasn’t logging on very often it wasn’t shocking. There were a bunch of new people in the guild that I had never seen or heard of before, along with the familiar faces that I have known for almost ten years. I’ve gone through a guild merge before, which ended up being decent at first and ending up not awesome. If I was a regular core raider of the guild, it might be different – but as a casual player who doesn’t do any raiding apart from LFR, I was feeling quite left out. I didn’t even feel comfortable speaking out in guild chat. After weighing all of the options, I made the decision to move my main character – Korath the Tauren Druid – over to the Moonrunner server and faction change to Alliance, so I could play with my friends that I knew and was comfortable with. A few years ago, I was fortunate enough to meet up with some people that I had met through blogging: specifically, Fannon from Dwarven Battle Medic and Ophelie from Bossy Pally. It was fantastic to meet other WoW bloggers and just to get to know other people. I’m a very shy and introverted person. One of the scariest moments of my life was getting out of my car and walking into the pub where we all met. However, it was one of the best choices I ever made. Through this meeting, it set up a get-together with other bloggers: this time with Vidyala and her husband Vosskah, and a few others. Instantly, my wife and I formed a friendship with them and were able to have great conversations. There was only one downside to all of these people. All of these people were Alliance, where my wife and I played Horde exclusively. (My very first characters were Alliance, but around the original Zul’Gurub patch I switched to Horde.) At that time, I server transferred my then level 60 mage to Moonrunner just to talk to them, and left it at that. Now, all this time later, it paid off. Unfortunately I did have to spend more money to do the server and faction change, but it was most definitely worth it – along with the fortunate timing of getting it on sale. The group of people I play with are fantastic, I’ve been able to meet a bunch of new people who are just a whole lot of fun. I know I’m still in the honeymoon phase, but I really don’t have any complaints as of yet. The only downside of my WoW time right now is that my wife isn’t playing anymore, but that’s just due to her complete lack of free time with looking after the kids during the days and working at night. Ah, the life of a young family. In a political sense, crossing the floor can be a disaster. Constituents feel like they were misled or betrayed, and it can cost someone their career. However, in this circumstance it has been one of the best choices I’ve made in a while. Once again, I’m excited to play WoW and habitually log in to check my garrison missions. Right, and actually play and have a crapload of fun. For the longest time, I was always the same type of character when I played any game. If there was a magic-dealing ranged class, that was me. I was your typical “mage”-class player, for my gaming career up until about three years ago. It was then that I seem to have had a bit of a shift in my mindset of what I enjoy, and I learned to love melee classes. My very first MMO was a game called Nexus: The Kingdom of the Winds (which is pretty much dead by all accounts now). It’s a standard 2.5D top-down RPG where you do the normal stuff: you level up, you kill stuff, you quest, you gain levels, you grow in power. My very first character was a healer, and when I got bored of that, my main character ended up being a mage. I got fairly powerful (by standards of the day), but never near the top of the power listings. I enjoyed being able to blow things up from afar, trying to stay away from those who would tear me apart. When I started World of Warcraft, my first character was a Druid. I had no clue how to properly play the game at the time, and somehow ended up speccing into the Balance tree. This was back in Vanilla, while the trees were still very broken, and I stopped playing for a while. When I came back, I re-rolled as a Mage, and once again was loving it. I could shoot stuff from my hands, blow things up, and still be far enough away that I (hopefully) shouldn’t die. When we re-rolled to Vek’nilash, my first Horde character was an Orc Warlock, and the time of bliss continued. It was when Burning Crusade released that things started to change. I had decided to re-roll as a Paladin to help the guild out with class balance, and through the process of leveling up I found out that being a melee class wasn’t so bad after all. I may get hit more often, but there were ways to accomodate that. 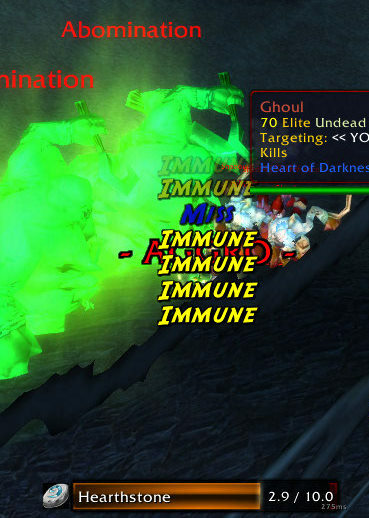 Once I had hit level 70, I did my time as a healer, so I returned to the back of the raid with my healy hands. I forget when exactly through Burning Crusade that my wife started to play, but it was at that time that I rolled a Druid to level up with her new Shaman. I specced into Feral, since I read that it was the best one for leveling, and thus began my time as full-time melee. We did quite well while leveling, as long as one of us reminded the other when our health or mana was low. All in all, the process to get to level 70 was quite fun and easy. I tore things up as a cat, and I got hit in the face as a bear. Through Wrath, I’ve been able to be near or at the top of the charts for DPS, while mastering a very complicated rotation (JFM, anyone?). It gives me a great deal of satisfaction that I can do something well, while still having fun. Going from 70 to 80 was a breeze, and I rarely had to get help for group quests or elite mobs. To this day, I still have my Feral Druid as my main character, and I plan on keeping it that way for a while. Until the class isn’t fun anymore, I finally found something that I can enjoy and stay competetive in a raid environment. It’s amazing what happens when you give something a try, isn’t it?